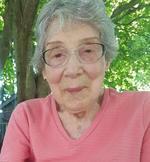 Carolyn Attenborough Obituary - Cornwall-On-Hudson, New York | Quigley-Sullivan Funeral Home, Inc.
Carolyn K. Attenborough, of Cornwall-On-Hudson, NY entered into eternal rest on October 8, 2017 at Fishkill Center for Rehabilitation & Nursing, Fishkill, NY. She was 88 years old. Carolyn was predeceased by her loving husband, The Rev. Albert A. Attenborough, Jr., STD, PhD. She is survived by her children: Victoria A. Johnson (Garry) of Cornwall, NY, Alexandra A. Pirard (Joel) of New Windsor, NY, Charlotte A. Dunaief (Jonathan) of Cornwall-On-Hudson, NY, Allen A. Attenborough (Charlotte) of Maplewood, NJ and R. Benn Attenborough (Ines) of Nanuet, NY; 10 grandchildren and two great-grandchildren and several step-grandchildren and their children. Visitation will be held from 2 to 4 p.m. and 6 to 8 p.m. on Thursday, October 12th at Quigley Bros. Funeral Home, 337 Hudson St. Cornwall-On-Hudson, NY. A Funeral Service will be held at 11 a.m. on Friday, October 13th at St. John’s Episcopal Church, 66 Clinton Street, Cornwall, NY. Cremation will take place at Cedar Hill Crematory, Middle Hope, NY. Memorial Contributions in Carolyn’s name may be made to Paws for Purple Hearts, 5860 Labath Avenue, Suite A, Rohnert Park, CA 94928 or to a charity of your choice.